Da Capo Lifelong Books, 9780738218793, 304pp. Nutrition is a vital component of anyone's fight against cancer, but loss of appetite and side effects of treatment can make even the simple act of eating a challenge. 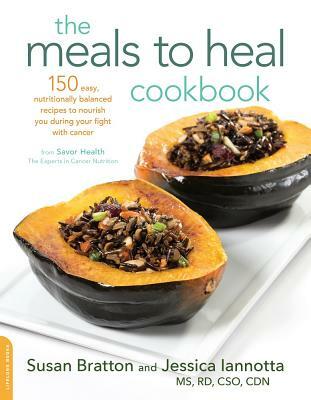 Written to meet the unique needs of cancer patients and caregivers, The Meals to Heal Cookbook offers 150 recipes to make eating less stressful, more convenient, and simply more enjoyable. Created by oncology-credentialed registered dietitians, these delicious, nourishing, easy-to-prepare dishes are full of the nutrients you need to maintain strength during treatment. Loaded with essential nutrition info and recipes coded by common symptoms and side effects (including fatigue, nausea, digestive issues, mouth sores, taste and smell aversion, and others). Susan Bratton is the Founder and CEO of Savor Health (formerly Meals to Heal), a comprehensive patient- and caregiver-focused cancer nutrition service. She also advocates for changes in our healthcare system that would make proper nutrition an integral part of cancer care delivery in the United States, and frequently speaks on this topic around the US. Among the groups she has spoken to include the National Ovarian Cancer Coalition, Lungevity, the Institute for International Research's Conference on Oncology and many others. Jessica Iannotta, MS, RD, CSO, CDN, is the Chief Operating Officer of Savor Health (formerly Meals to Heal). She is a registered dietitian and certified specialist in oncology nutrition (CSO), and began her career as an oncology dietitian in 2001. She currently manages the oncology nutrition and customer service teams at Savor Health, ensuring that every patient and caregiver speaks to an experienced oncology professional and receives helpful and safe information. This is definitely a book to consider as a gift for anyone who has cancer, is recovering from cancer, or who is caring for someone suffering from this disease. [It] is a go-to resource addressing all of the major food, cooking, and nutrition questions asked by patients and caregivers in a straightforward, accessible, and supportive manner. Whether you or someone you know is fighting the big C, or you just want access to simple, yet super wholesome recipes, The Meals To Heal Cookbook is for you. real world, wholesome recipes that provide nutrients making you stronger and presented in a way that tackles your side effects and manages your symptoms. Highly recommended read.